As a member of your local food co-op, you know the difference that co-ops make in your community. And as part of our celebrations of the Co-operative Decade, the Neighboring Food Co-op Association is profiling other co-operative businesses that are building a thriving co-operative economy in our region. Pedal People is a worker co-operative located in Northampton, Massachusetts that provides bicycle-powered delivery of groceries, as well as hauling for yard waste, recycling, and trash. The co-op has been expanding in recent years, reflecting community interest in more sustainable ways of living, and now includes twelve members. Supporting the co-operative movement through development of resources and collaboration with other co-ops is a core interest of the worker-owners at Pedal People. As a founding member of the Valley Alliance of Worker Co-operatives (VAWC), a regional association of co-ops in western New England, the collective helps to educate and develop community awareness about democratically owned and managed enterprise. 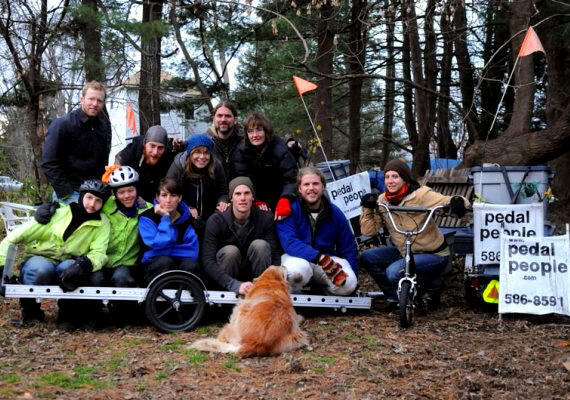 In 2010, Pedal People members made a decision to put surplus profits to work for the good of the wider co-operative economy by investing in the Cooperative Fund of New England (CFNE), in accordance with the co-operative principles of cooperation among co-operatives and concern for community. “We didn’t particularly want to put it in a bank, and the idea of putting it into a co-operative fund fit with our ideals,” explains co-op member Alex Jarrett. Pedal People’s investment in CFNE increases the resources available to other co-operatives in the region, strengthening financial options for start-ups, and providing access to technical assistance. Pedal People actively demonstrates cooperation among co-ops. Working with the River Valley Co-op Market, they sponsor bike stations at special events to encourage more bicycling to the food co-op and offer outdoor, theft-proof maintenance stations. Pedal People also delivers local food for Valley Green Feast, a local foods delivery co-op, and do all of their printing with the worker co-op Collective Copies, a digital copying and finishing center. As they expand their delivery services, they hope to work more with local co-ops. “One thing I like about worker co-ops is the power of the culture we are creating together. While most new workers coming into our co-op have some experience with co-operation, I’m impressed by how quickly new people fit into our culture of working together,” says Alex Jarrett. During the International Year of Co-ops in 2012, Pedal People will celebrate their 10th anniversary and launch an online ordering system for delivery. They are also working with an intern from the UMass Co-operative Enterprise Certificate program who is doing research on expanding their delivery services. To learn more about Pedal People, visit www.pedalpeople.com. Profile written by Kalista Aird for the Cooperative Fund of New England, www.coopfund.coop.